Don't let the title fool you; Amour is about as far from a romance as you can get, though it is about two people who love each other. It deals with an elderly woman who has a series of strokes, and her husband who cares for her as she drastically deteriorates. It's gruelling, it's hard to watch, it's unpleasant. There is literally nothing at all pleasant about it. It doesn't fill you with a warm feeling of sweetness at how much the husband sacrifices for his wife, because it's really hard on him and he seems quite miserable. Of course, that's the point. Sacrifice is sacrifice, one doesn't usually enjoy it. 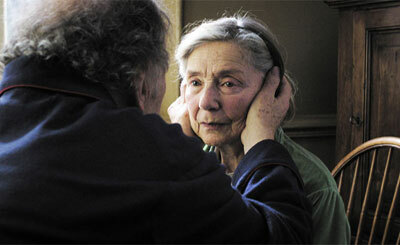 But Amour is so very hard to watch, in spite of the fact that Emmanuelle Riva was nominated for an Academy Award for her role as Anne, the stroke victim, and the film was nominated for Best Picture, Best Director and Best Screenplay and won for Best Foreign Film. While the host leaves the room to get the tea, the audience endures, in real time, the person just sitting in the room waiting for the tea. It astounds me that anyone thought the film was worthy of any of those awards, except, perhaps, Riva's nomination, because, completely divorced from the fact that it's tragic and uncomfortable, it's very slow ... excruciatingly so. What director films a scene in which a person is offered a cup of tea, and then, while the host leaves the room to get the tea, the audience endures, in real time, the person just sitting in the room waiting for the tea - doing absolutely nothing for the full three minutes or so that it takes for the host to make the beverage? Three minutes of nothing on film is a very long time. And finally, the ending is incredibly confusing - or at least it was for me. I didn't even know if it was happy or sad, I only know that my husband and I suffered through the whole thing waiting for redemption of some kind - a resolution that never came. Please, don't think that I don't admire and feel for the people who are caretakers, whether by choice or not, of very sick or disabled people, giving up their own lives out of love, or lack of money, or because it's their job. I may even find myself in the position of being a caretaker one day, and know many people who have done it. And of course any of us could end up being the person who needs to be cared for in dire circumstances. All of it is difficult, wrenching, and depressing, I get it. But I don't watch movies to be left with a sense of complete hopelessness. I watch them, not only to be entertained, but to be moved, to learn something, to be changed. I got none of that from Amour. Watch it at the risk of enduring a very sad, and very long, two hours.